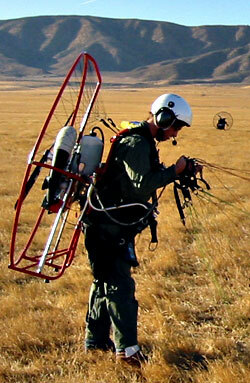 Paramotoring and Powered Paragliding - Powered Paraglider Lessons: Learn to fly your own personal aircraft! Our Dealer Network of Certified USPPA Instructors will guide you from your first inflations running with the wing all the way through a thorough training program. Using the USPPA Syllabus, they will explore practical skills such as preflight, setup, kiting, launching, flying, approach, landing as well as equipment, weather, active piloting, staying legal, aerodynamics, soaring lifting air, reserve parachute, risk management, motor and glider care, and much more! Check our Dealer Map to contact a trainer for an introductory lesson that will sweep you off your feet! Your other post mentioned you’ll be getting your machine “hopefully” around the end of April. That seems like an awful long time for delivery. In your original post you asked for any words of wisdom. I’m inferring from your statement of eight years of hang gliding experience, that you are an adult who can think for himself, so I figure you can get what you need to from the discussion below and don’t need anyone to draw conclusions for you. In the sport of powered paragliding, there are two leading pariahs. I’ll leave it to you to figure who they are. In your research you’ll find that both do have some supporters. I’ve posted a link to one such supporter below. I’ll say that I do not know Kurt Fister, nor was I there when the incident described below occurred. It happened a few years ago. I hope the links below will aid you in your research on this incident and others. Please research further to arrive at your own version of reality. The bottom line is that there is a nice grass strip airport on the west coast of Florida, Airport Manatee, that used to be open to PPG pilots. In the heyday of PPCs, a PPC dealer even had his business hangered there. Kurt and some of his friends/students flew in and misbehaved. There was an exchange between Kurt and the airport manager and the end result was that they were told leave and never to come back, an “invitation” that extended to ALL ram air wing pilots, including me, including YOU, including Rick Pitino, and anyone else who might want to fly a PPG or PPC there. I understand Kurt has an alternate version of the story. I once worked for a company that had an executive who was always coming up with wild ideas, most of which were complex and very hard to execute. Some were brilliant, and some not so much, but he’d come to us and say “Do this,” and we were left to try to figure things out. One of the guys started referring to him as “Goose.” I asked how he made up that nickname. He said, “You know, he comes in, he shits, then he leaves.” If you’re not worried about losing your own flying site and don’t mind committing one of the worst PPG sins possible, causing others to lose THEIR site, you can be a Goose. Again, I’ll state that I have not met Kurt Fister, nor was I present at the Airport Manatee incident. However, I would not post such material if I did not have a reliable source and some corroboration. The PPGBiglist has references to a couple of other spots where flying sites were lost. I don’t know which Fresh Breeze model you’re getting but the company has been around for a long time. Your machine is likely a good one, but unlike what you may have been told, isn’t necessarily the only perfect machine for you, as indicated in one of the links above. Since you’ve been a pilot, you’re more likely to be able to recognize better than a total rookie when you’re under control and safe during training. If you’re training is to be in Louisville, be sure to refrain from any activity that might jeopardize your access to the flying field or airport. This would include consideration of noise, as well as interference with GA or other aircraft that may be using the facility.